Automation systems must integrate multiple power and control subsystems and components into a coherent whole. Read on to learn more about machine automation basics. Chip McDaniel, who works in technical marketing for AutomationDirect, wrote an article for the Mar/Apr 2019 issue of InTech magazine titled Machine Automation Basics. In the article, he first lays out the rationale for improved automation systems. The article then proceeds to discuss the main items typically used in automation systems. For smaller machines, a single panel is often used to house both the power distribution system and the control components. At the machine, the NFPA 79: Electrical Standard for Industrial Machinery is the benchmark for industrial machine safety related to fire and electrical hazards. Some of the major requirements for machine control power distribution discussed in these standards include using proper disconnect means, protecting personnel from contact with electrical hazards, and protecting equipment from overcurrent and overloads. Motors have special needs in machine control. For every motor, a proper form of electrical control is required, from simple on/off to more complex variable speed applications. Motor control devices include manual motor starters, motor contactors and starters with overloads, drives, and soft starters. These Fuji manual motor starters and contactors from AutomationDirect have high switching capacity and integrate the functions of a molded case circuit breaker and a thermal overload relay. Additional protection to consider for machine control components includes loss of cooling and abnormal temperatures. Ground fault protection is also needed, so a proper ground connection is important. A risk assessment drives the safety system design as needed to remove motion-causing energy, including electrical and fluid power, to safely stop the equipment for protection of both personnel and machines. There are various methods for implementing safety systems. In small machine control applications, a safety relay is probably the simplest way to integrate safety functionality for emergency stop, monitoring a guard door, or protecting an operator reaching through a light curtain. In more advanced machines, safety-rated controllers provide the same functions, but can simplify the integration of multiple safety devices. Available in form factors from small to large, the machine controller can be a programmable logic controller (PLC), a programmable automation controller (PAC) or a PC. The software used to program a family of controllers should be closely examined for ease of use and other features. Using the same software platform to program a family of controllers is becoming the norm. This allows the designer to first program the system, and then select the right controller based on its capacity to handle the number of I/O points needed, as well as special functions such as proportional, integral, derivative control and data handling. Discrete and analog inputs and outputs connect the controller to the machine sensors and actuators. These signals can originate in the main control panel through a terminal strip with wiring to field devices, but a distributed I/O architecture is often a better solution. Another important part of machine control now and for the future is extensive communication capability. It is a good practice to have multiple Ethernet and serial ports available to integrate to a variety of equipment, computers, HMIs, and business and enterprise systems. Multiple high-speed Ethernet ports ensure responsive HMI communication, as well as peer-to-peer and business system networking. Support of industrial Ethernet protocols, including EtherNet/IP and Modbus TCP/IP, is also important for scanner/client and adapter/server connections. The HMI shows vital information about machine conditions using graphical and textual views. HMIs can be in the form of touch panels, text panels, message displays, or industrial monitors. They are used for monitoring, control, status reporting and many other functions. 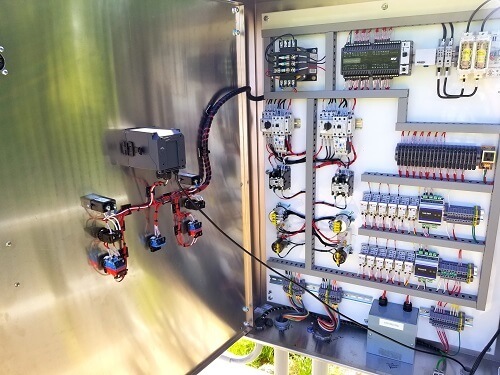 Machine automation systems consist of multiple subsystems and components to provide the required power distribution, safety, and real-time control. Each of these subsystems and components must work together, and many are often networked to each other via either hardwiring, or increasingly via digital communication links. Careful design and upfront planning will ensure the automation system is reliable, easy to maintain and flexible. To read more related articles, click here.